Working out can be a challenge, especially as we get older. Weak muscles and fear of injury tend to get in the way of exercise. Instead, we try to stay fit by eating a well-balanced diet. However, for older individuals, dieting can cause problems like increased frailty. Fortunately, working out doesn’t have to be a challenge and is recommended. 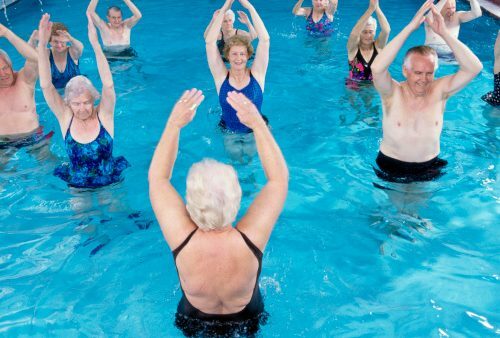 A new study suggests that the best option for overweight seniors is to take up both aerobic and resistance exercises. It is estimated that more than a third of people age 65 and older in the United States are obese. Being excessively overweight at this age can worsen age-related decline in physical functioning and lead to frailty. Weight loss from excessive dieting can also lead to harmful declines in muscle mass and bone density. These are the problems the researchers wanted to address in their study, and they believe they have found a happy medium. Engaging study participants in aerobic and resistant exercise while losing weight helped them maintain muscle mass and bone density. Those who did just one type of exercise or none at all did not see as great of a benefit in this regard. “The best way to improve functional status and reverse frailty in older adults with obesity is by means of diet and regular exercise using a combination of resistance and aerobic exercise training,” said study leader Dr. Dennis Villareal, professor of medicine at Baylor College of Medicine in Houston. The study in question involved randomly dividing 160 obese and sedentary adults, 65 years or older, into four groups: weight loss and aerobic training, weight loss and resistant training, weight loss and a combination of the two, and a control group who did not exercise or try to lose weight. The study lasted six months with physical performance scores taken throughout. The researchers saw an increase of 21 percent in the combination exercise group and only 14 percent among those who only did one of the exercises. Lean muscle mass and bone density also declined less in the combination group as well. Staying healthy in our old age is more about retaining function. Maintaining muscle strength and bone density is essential to staying mobile and preserving independence.